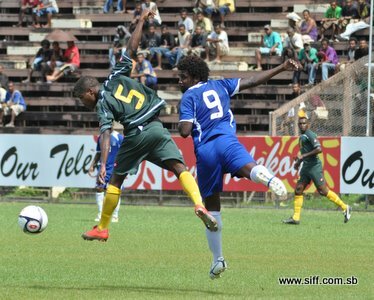 After the opening fixture O-League representative club Koloale who are riding on a 6 – 1 win over Lautoka last Saturday will take on Hana who has been building up its ranks in preparation for the Telekom S-League since its application was approved in December. The exciting Saturday is followed by 2 more matches on Sunday: the first is between Western United and Marist Fire, kicking off at 1:00pm and the second is the main match of the weekend featuring former O-League finalists KOSSA and 2010 national club championship finalists Solomon Warriors. The line up of matches for the first weekend itself is impressive and is reflective of weekends to come in the Telekom S-League with the public having the opportunity to watch big matches throughout each week. Teams have spent this week playing friendly matches in preparation for the first round the highlights being one between KOSSA and Malaita Kingz played at the Aligegeo football field in Auki won by the former 2 – 1 and the match up between Solomon Warriors and Western United which ended in a draw. SIFF General Secretary, Eddie Ngava, is optimistic about the start of the Telekom S-League saying that his office is eager to get things moving. Ngava has also brushed aside the air of controversy surrounding teams which are not willing to play on Saturdays due to religious convictions. “Time is not on our side. There is a deadline for the nomination of our O-League representative and we need to ensure that we meet this requirement or else the purpose of the S-League is defeated,” Ngava says. One of the clubs scheduled for the opening match has expressed reservations about playing on Saturdays and in addition to protesting the fixtures it has also made a press statement which stated that they might boycott the games, however, no official confirmation has been received about the their intentions. However, Ngava says that the same rule shall apply to all clubs participating in the Telekom S-League if they fail to turn up.